王芳, 孙耀贵, 尹伟, 范阔海, 段智变, 孙娜, 李宏全. 苦参碱联合黄芩苷对LPS诱导小鼠肺炎的影响[J]. 中国药理学通报, 2018, 34(8): 1105-1109. WANG Fang, SUN Yao-gui, YIN Wei, FAN Kuo-hai, DUAN Zhi-bian, SUN Na, LI Hong-quan. Effects of matrine combined with baicalin on mouse pneumonia induced by LPS[J]. Chinese Pharmacological Bulletin, 2018, 34(8): 1105-1109. Abstract: Aim To investigate the effects of matrine combined with baicalin on lipopolysaccharide (LPS) induced lung injury in mice. Methods Forty-two mice were randomly divided into seven groups, including control group, LPS group, matrine group, baicalin group, combined high dose group, combined middle dose group and combined low dose group. A mouse model of acute lung injury was established by intraperitoneal injection of 20 mg·kg-1 LPS. Various concentrations of baicalin, matrine and matrine combined with baicalin were injected intraperitoneally 30 min after the administration of LPS. After 24 h of LPS challenge, serum was collected to examine the levels of interleukin (IL)-6 and tumor necrosis factor (TNF)-α by ELISA. The lung tissues were isolated for observing pathological changes by HE staining and measuring the IL-6 and TNF-α mRNA levels by qPCR. MPO activity was determined by MPO activity kit. Results The intraperitoneal administration of LPS significantly damaged pulmonary function and induced inflammatory cell infiltration into the lungs. Compared with control group, the levels of IL-6 and TNF-α in both serum and lung tissues of LPS group increased (P < 0.01). Compared with LPS group, pulmonary function in compound treatment groups was improved, the levels of IL-6 and TNF-α in lung tissues significantly decreased(P < 0.01), and the levels in serum showed a downward trend. The MPO activities in compound treatment groups were reduced (P < 0.05). Conclusions Both matrine and baicalin possess anti-inflammation effects and no significant difference exists between 7.5 mg·kg-1 matrine combined with 50 mg·kg-1 baicalin and 30 mg·kg-1 matrine alone group or 200 mg·kg-1 baicalin alone group. Considering with the dosage and efficacy, the low dose of matrine combined with baicalin has more economic benefit and lower toxicity, as well as the minimum cost than other groups, hence it is recommended in future clinical application. Fig 1 Observation of histopathological changes in lung tissues of different treatment groups (×400) A: Control group; B: LPS group; C: Baicalin group; D: Matrine group; E: Combined high dose group; F: Combined middle dose group; G: Combined low dose group. 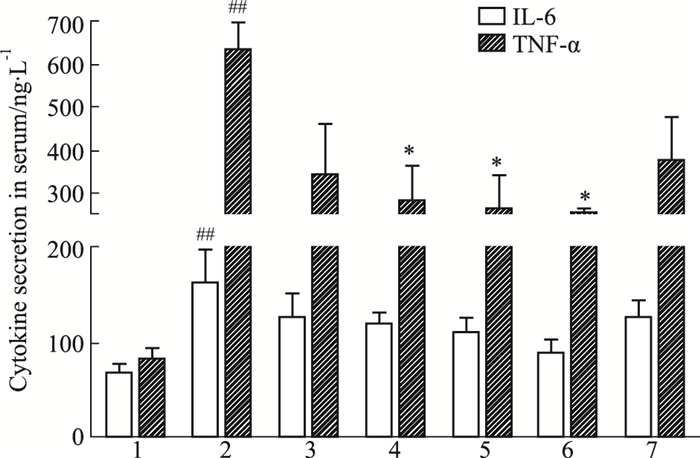 Fig 2 ffects of different treatment on IL-6 and TNF-α secretion in serum (x±s, n=6) 1:Control group; 2:LPS group; 3:Matrine group; 4:Baicalin group; 5:Combined high dose group; 6:Combined medium dose group; 7: Combined low dose group. ##P < 0.01 vs control group; *P < 0.05 vs LPS group. 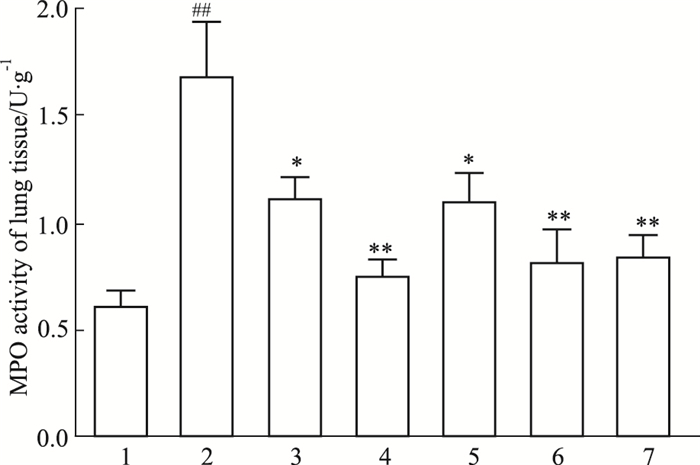 Fig 3 Effects of different treatment on IL-6 and TNF-α mRNA expression of lung tissues (x±s, n=6) 1:Control group; 2:LPS group; 3:Matrine group; 4:Baicalin group; 5:Combined high dose group; 6:Combined medium dose group; 7: Combined low dose group. ##P < 0.01 vs control group; **P < 0.01 vs LPS group. Fig 4 Effects of different treatment on MPO activities of lung tissues (x±s, n=6) 1:Control group; 2:LPS group; 3:Matrine group; 4:Baicalin group; 5:Combined high dose group; 6:Combined medium dose group; 7: Combined low dose group. ##P < 0.01 vs control group; *P < 0.05, **P < 0.01 vs LPS group. Wu G, Zhou W, Zhao J, et al. Matrine alleviates lipopolysaccharide-induced intestinal inflammation and oxidative stress via CCR7 signal[J]. Oncotarget, 2017, 8(7): 11621-8. Shen K, Feng X, Pan H, et al. Baicalin ameliorates experimental liver cholestasis in mice by modulation of oxidative stress, inflammation, and NRF2 transcription factor[J]. Oxid Med Cell Longev, 2017, 2017: 6169128. Sun N, Sun P, Lv H, et al. Matrine displayed antiviral activity in porcine alveolar macrophages co-infected by porcine reproductive and respiratory syndrome virus and porcine circovirus type 2[J]. Sci Rep, 2016, 15(6): 24401-13. Liou C, Lai Y, Chen Y, et al. Matrine attenuates COX-2 and ICAM-1 expressions in human lung epithelial cells and prevents acute lung injury in LPS-induced mice[J]. Mediators Inflamm, 2016, 2016: 3630485. 张晓哲. 阿维菌素对脂多糖诱导的急性肺损伤小鼠的保护作用[D]. 长春: 吉林大学, 2012. Zhang X Z. 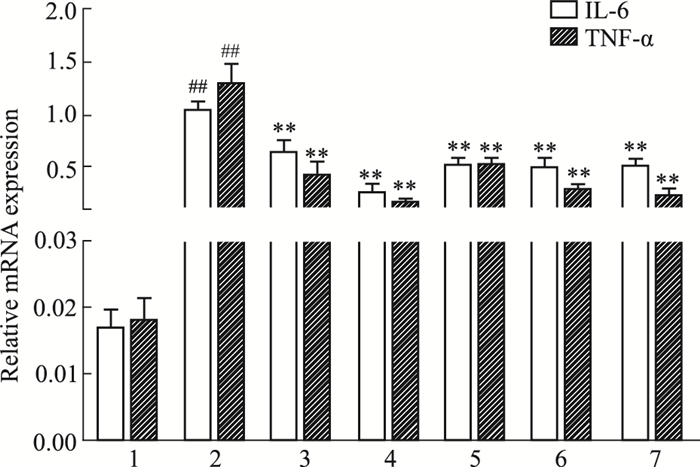 Protective effect of abamectin on acute lung injury induced by lipopolysaccharide in mice[D]. Changchun: Jilin University, 2012. 汪雪峰, 陈茜茜, 崔金瑜, 等. 莰醇对脂多糖诱导急性肺损伤的保护作用研究[J]. 中国药理学通报, 2018, 34(3): 388-93. Wang X F, Chen X X, Cui J Y, et al. 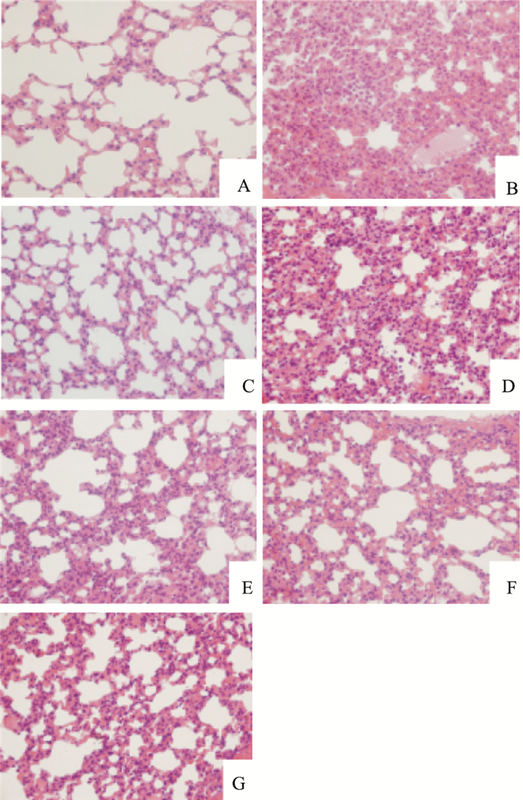 The protective effect of broneol on LPS induced acute lung injury[J]. Chin Pharmacol Bull, 2018, 34(3): 388-93. Espírito-Santo R F, Meira C S, Costa R D S, et al. The anti-inflammatory and immunomodulatory potential of braylin: pharmacological properties and mechanisms by in silico, in vitro and in vivo approaches[J]. PLoS One, 2017, 12(6). 胡涛, 王加启, 张养东, 等. 阴外动脉注射脂多糖对奶牛临床症状及白细胞的影响[J]. 中国畜牧兽医, 2011, 38(6): 5-9. Hu T, Wang J Q, Zhang Y D, et al. Effect of external pudendal artery infusion of lipopolysaccharide on clinic symptoms and white blood cells in dairy cows[J]. China Anim Husb Vet Med, 2011, 38(6): 5-9. Yin N, Peng Z, Li B, et al. Isoflurane attenuates lipopolysaccharide-induced acute lung injury by inhibiting ROS-mediated NLRP3 inflammasome activation[J]. Am J Transl Res, 2016, 8(5): 2033-46. Chinese Pharmacological Bulletin, 2018, 34(8): 1105-1109.